Whelp. 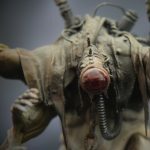 That's January done, which means four weeks of mine and Brother Pink's Paint Yoshit Challenge have passed, and the amassed group above is all the progress I made in January. 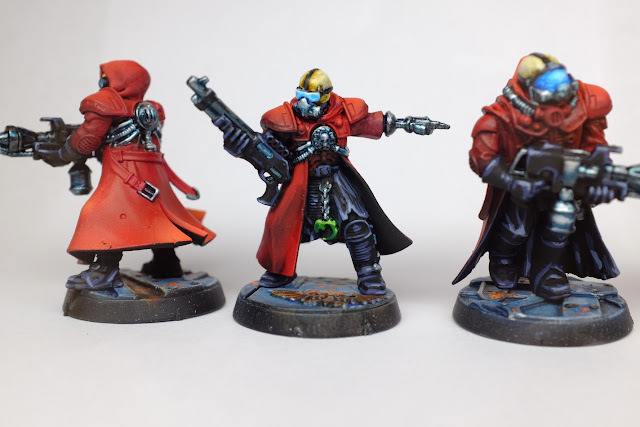 In that photo we have the Neophytes I completed in Week 1, the Acolytes that took until end of Week 3 (BLOODY. CHITIN. ), and on the right the Enforcers I just polished off at the end of Week 4. And, as we have yet to see a second update from Brother P., I may just be out to a phenomenal lead! I'll keep my tentacles crossed. 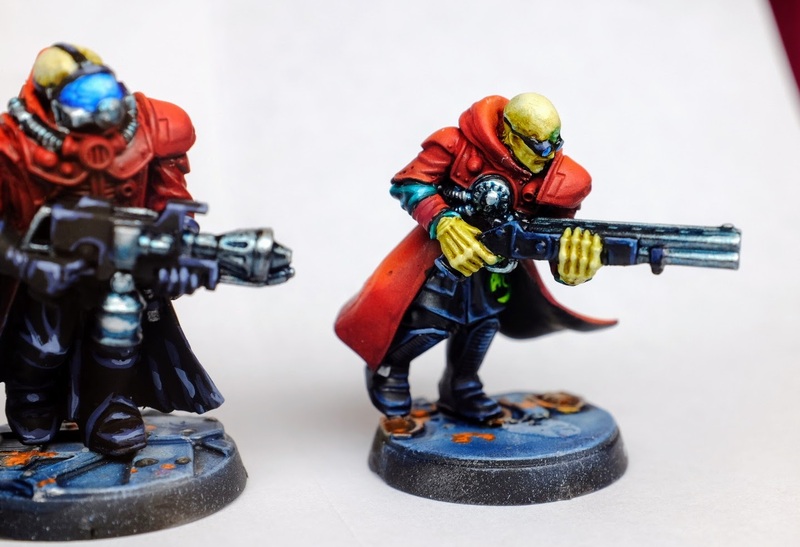 - 12 Genestealer Neophytes, which I'm calling Enforcers. 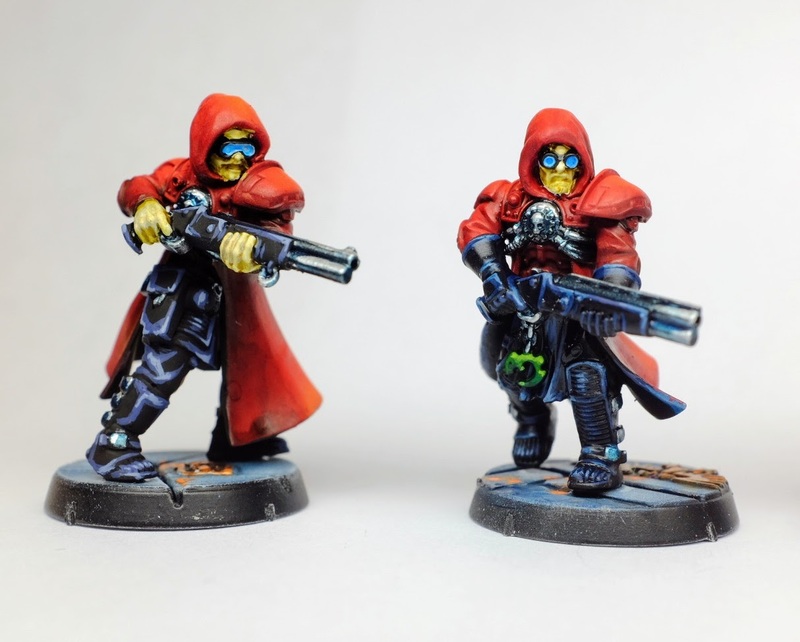 Though it was a pain to paint inside the hoods once they'd been airbrushed, the fact that I airbrushed large swathes of these models made them pretty quick. However, I should have masked and airbrushed the black as well since line highlighting it was a pain and came out a bit rough on a couple of the dudes. Here are some individual shots of the squad. No other progress to report this week as it was a busy one, and I'm clearing the decks for Week 5. 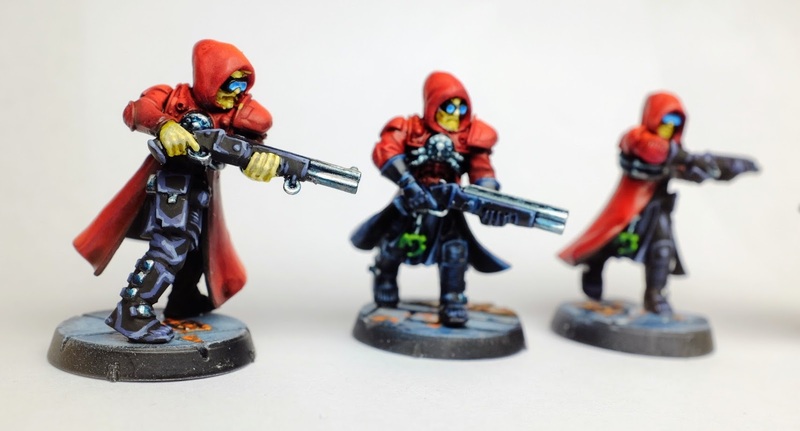 That's because Week 5 marks the start of SQUADUARY: a challenge to get a squad assembled, painted, and based in the month of February. However, since I'm a masochist, I'm going to try to see how many squads I'm able to complete in that time frame. This week's task is to assemble a bunch of minis. Wish me luck! Nice! Where did you get those shoulder pads? I don't recognize them. 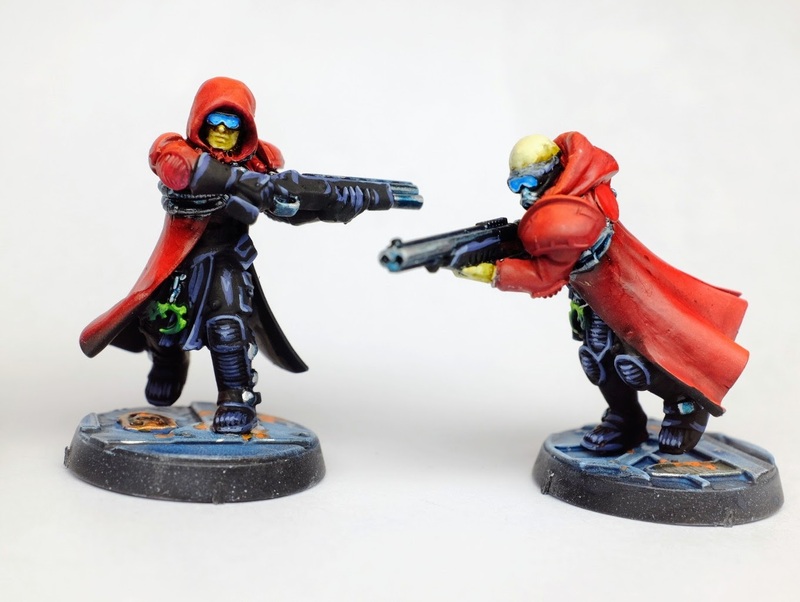 They're from the Dreamforge Einzatsgrupen or whatever. I bought one of their APC kits, and it has models to put 12 troopers sitting in the back. Glad to hear it, Naf! Sector imperialis bases are probably the best thing that's happened to me as far as basing is concerned. 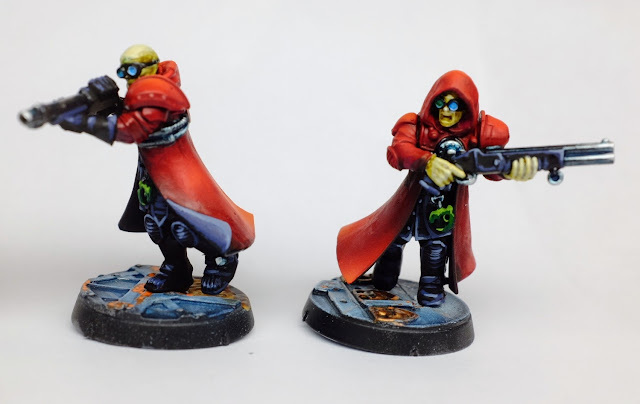 They're so easy to paint with a little airbrushing and then washes. 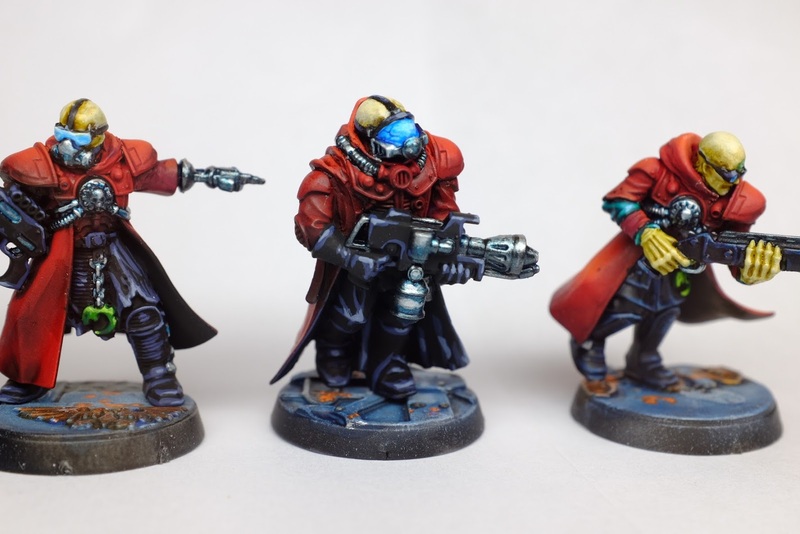 Your Enforcers are looking really nice. The bright red overcoats are really striking and are accented well with the blue sun glasses/visors. The shotguns are my favorite part, the bluish oily sheen on the metal looks awesome. Cheers Adam! I'm not really sure why I went with the blue metal...I feel like it might have been inspired by my long distance love for Alpha Legion. 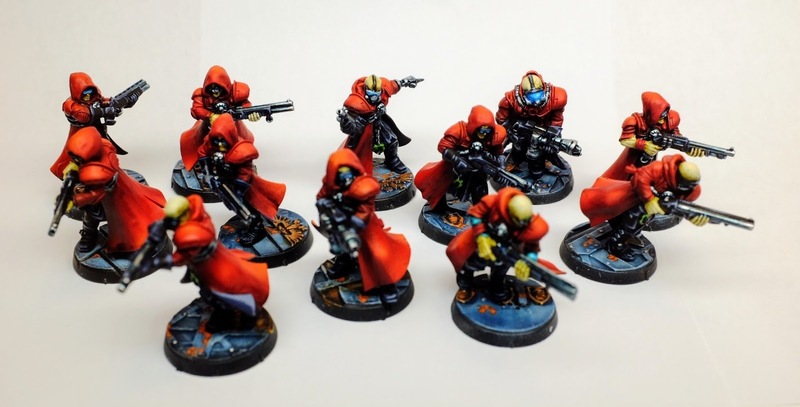 As for the red overcoats, I want to introduce more red into my army at the higher levels to show prestige. 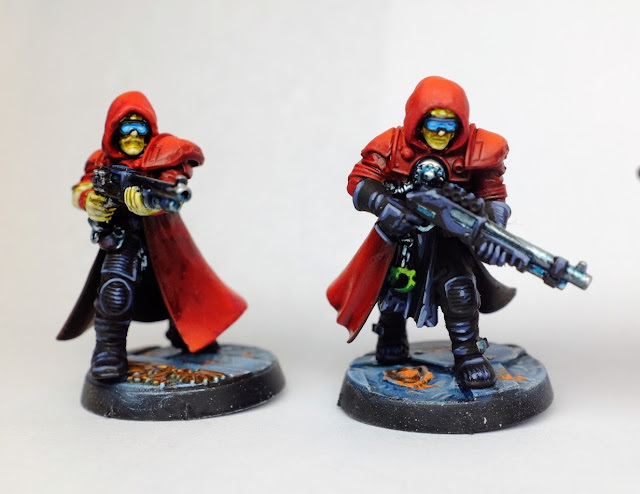 These are meant to be the most elite of my Neophytes, and I want to have my most elite Acolytes in red robes of their own. Then, of course, my patriarch will also be sporting a red robe. The poses of the enforcers are great by being so dynamic and animated. Nothing looks alike. Well played. I'm glad that comes through, Rory. I really wanted to pick up on the way the Admech cloaks are flapping to give the feeling of motion to the models. Those look great, man - really been enjoying seeing 'em come together! Thanks Joe! 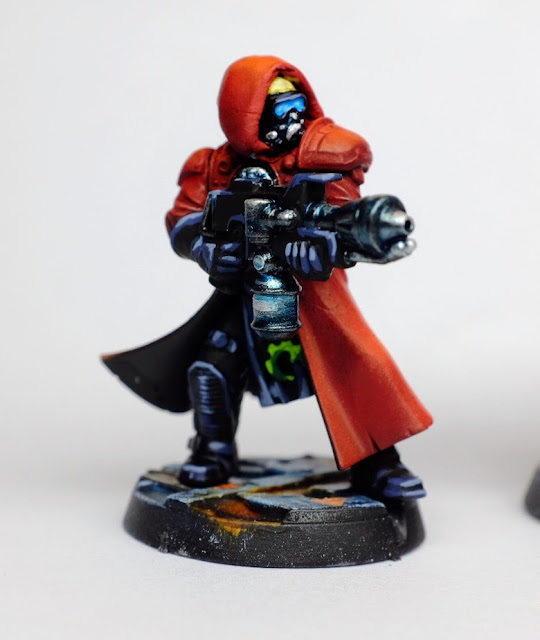 I'm not entirely happy with the colours I used since the highest of the highlights is technically orange, so I'm open to anyone's suggestions for good red highlight colours that aren't orange.